M does the heavy lifting in terms of writing our blogs, but K insisted on poking in for a bit to write this book review. Now, before I get started, in the interest of full disclosure, I will tell you that Thomas Willeford of Brute Force Studios is one of our favorite people. He is a sweet, kind, funny, intelligent, talented, gruff old goat, and he’s our kind of crazy. If you are unfamiliar with his name, don’t be surprised if you are familiar with his work. You know that arm that Nathan Fillion wore at the end of the steampunk episode of “Castle” ? Yeah, Thomas made that. Thomas’s work has been featured in several compendia about steampunk art and accessories, he has been a featured guest at several steampunk (and general fandom) conventions, and he has contributed designs to Alchemy Gothic. Now, having said all these wonderful things, I should point out that they have no bearing whatsoever on our review of this book. 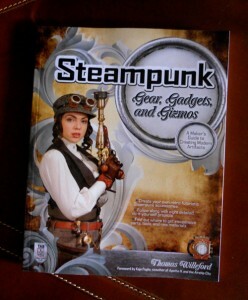 Steampunk Gear, Gadgets, and Gizmos: A Maker’s Guide to Creating Modern Artifacts is far and away the best DIY maker book I’ve ever read. I mean that in all sincerity. I am an avid reader and collector of all books relating to making. I’ve got books on assemblage, mixed media, paper crafting, jewelry arts, metalworking, leatherworking, and just about everything else you can image. 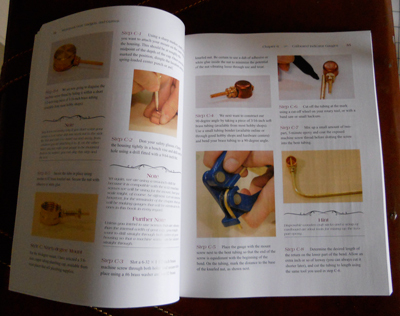 Most of the time, these books show artistic photos of beautiful projects and give either super simplistic instructions for making simple projects, or they show artistic photos of beautiful projects and give detailed instructions assuming that you already have experience with advanced techniques. 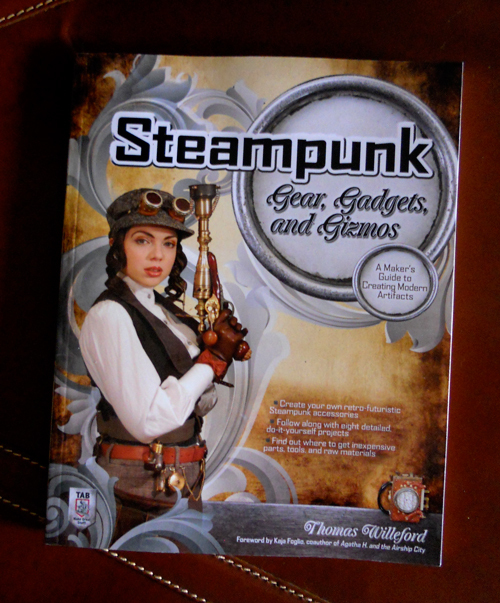 But this book – Steampunk Gear, Gadgets, and Gizmos – covers a lot of advanced projects with simple, straightforward directions for every single step. With this book, you will be walked through measuring, cutting, sawing, drilling, punching, sanding, riveting, and more. You will use metal, plastic, leather, wood, and glass. 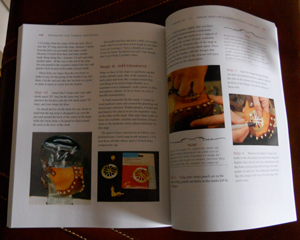 There are no shortcuts to making the glorious projects in these pages, but when you are finished, you will have steampunk accessories that you can be proud of. We highly recommend that you pick up a copy of his book and that you follow Thomas on Facebook at his fan page.